Yesterday I wrote about the best thing. I now realise I was a little hasty, I was not in full possession of all the facts. Because what is abundantly clear to me now is that the Mawnan Owlman is the best thing. Ever. No comebacks. I love cryptozoology. I can't remember if I've ever written about that here before or not. I imagine I would have done. How could I not have? I am completely obsessed by it and the idea of unknown and undiscovered creatures living alongside us, mainly (it has to be said) subsisting exclusively on a diet which seems to be domesticated ovines. However, not all cryptids are blood-sucking, sheep-worrying, hell demons with super powers. Some of them are rather more sedate and English. Like the Mawnan Owlman. The thing that really draws me to this is the picture made after the description of the teenage girl who saw it. Especially the shoes. It seems to me that Mr. Benn made himself some wings and an owl mask and went for a bit of a fly. 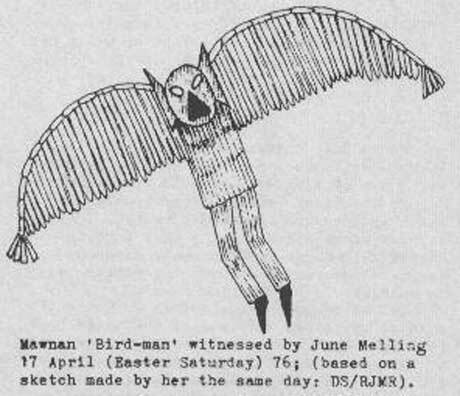 This is backed up by the fact that, unlike many cryptozoological phenomena - the majority of which will appear to countless generations over a period of several hundred years, presumably due to the longevity-increasing diet of sweet, sweet lamb - the Mawnan Owlman appeared For One Night Only. Like Sinatra. 17th April 1976. A key date in the study of Owlmen and Owlpeople everywhere. Obviously, I look at cryptozoology through something of a sceptical prism. But I never want to be dismissive of it. It's these little unknown things which make life magical. And that is why it is DEFINITELY the best thing.